A ZIP file is a compressed folder containing multiple files. It allows you to transfer many files at once, and takes up less storage space than the files would if they were not compressed. It’s also an easy way for a Seller to distribute many files together (often called a bundle on TpT). ZIP files are a common way to distribute content on TpT. Both Windows and Mac OSX are able to open and uncompress ZIP files without additional software. iPhones and iPads will require an additional app. Here’s how to open a ZIP file that you’ve downloaded from TpT. Choose “Extract All” from the menu that opens. Choose a destination. This is the place where you want to keep the unzipped files. You can choose “My Documents,” for example. After downloading the file, locate it using the download bar at the bottom of the Google Chrome browser, and click to open the Extraction Tool. 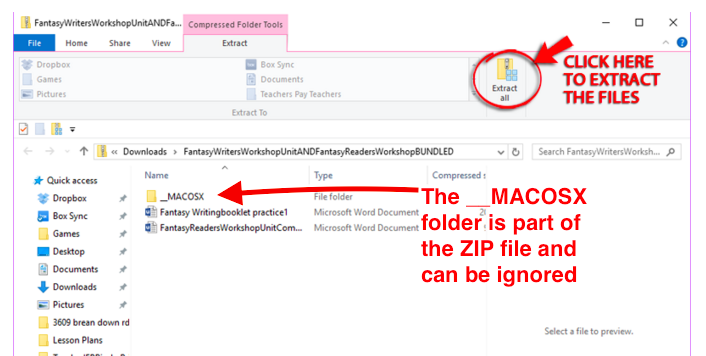 After extraction is complete, a new folder window will open containing the files inside the ZIP. If you see a folder named _MACOSX, you can delete or ignore it. Those files are created when the ZIP is made on a Mac, and are not used by Windows. Double-click the unopened ZIP — the file should extract automatically. If that doesn’t work, hold down the control key and click the ZIP file icon. Choose “Open With” and then select “Archive Utility.” The utility will extract the ZIP files, and you can find them in the same folder where you downloaded them. What if I’m using a mobile iOS device, such as an iPhone or iPad, instead of a computer? If you’re using an iPhone or iPad, you’ll need to download and install an app. We recommend iZip, a popular and reliable option that is free in the App Store. After you have the app installed, log in and go to your “My Purchases” page. Tap “Download Now” next to the zipped resource. When the download is complete, you’ll be redirected to a page where you can choose how to open the file. That will redirect you to iZip. Tap “OK” to extract. Tap the individual files within the folder, and they’ll open in the appropriate program. What if I’ve tried these instructions, and I’m still having trouble opening a ZIP file? What if I’m receiving error messages about a ZIP file? “Path too long” — The complete filename, including its location in your system, is too long. This is probably because there are nested folders in the ZIP. Try extracting it to a new folder on your desktop, instead of in your system folders. You can move the folder later. “The destination file could not be created” — This message can occur when the ZIP file is in a protected area. Try moving the ZIP file into one of your user profile folders, such as “Downloads” or “Documents,” before extracting it. If that doesn’t work, the ZIP file may be corrupted, or may have strong compression that Windows cannot open. If you get a different error or need another solution, contact us or try one of the free websites above. “Operation not permitted” or “No such file or directory” – These are rare and somewhat general messages that often mean the file is corrupted or otherwise inaccessible. If you’re unable to resolve the issue, contact us or try one of the free websites listed above. What if I can see the files listed in the ZIP folder, but I’m unable to open them? If you’re using Windows, this can happen if you’re previewing a ZIP file that was made in Mac OSX. Apple’s compression software adds an extra folder and files that can make it tricky to extract the ZIP using Windows. This folder contains data needed for managing the ZIP on a Mac. Since it is a subfolder in the ZIP file, you should be able to back up one folder level and see the actual contents of the ZIP file. If you’re unable to avoid the “_MacOSX” folder and get the ZIP contents extracted to your Windows system, please contact us or try one of the free websites mentioned above.